A nice Fall, leaf picture; what more could one ask for? Well, I guess I could say more. 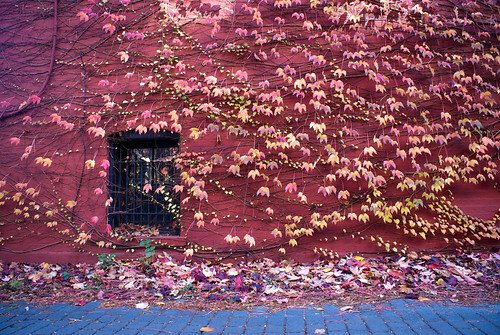 Not only do the light reds and yellows of the leaves compliment the strong red of the brick wall, but the dark color of the window nicely interrupts the lines of the wall, brick pavement, and vines. Further, when you look at the picture, you start to notice that all the leaves are pointing down, as if the shot was taken between gusts of wind. And you start waiting for the next gust, to start moving these leaves. Back to the lines of the vines; going from bare to leafy, left to right, adds a fascinating depth to the shot. Not so simple of a shot, now is it? Yep, caroline.angelo certainly captured a perfect Fall scene. It really makes you miss those wonderful colors.